Between their pincers and poisonous stingers, you'd really think that scorpions are already more than scary enough for one species. But that still leaves their unearthly - and unexplained - ability to glow a strange blue color in ultraviolet light. 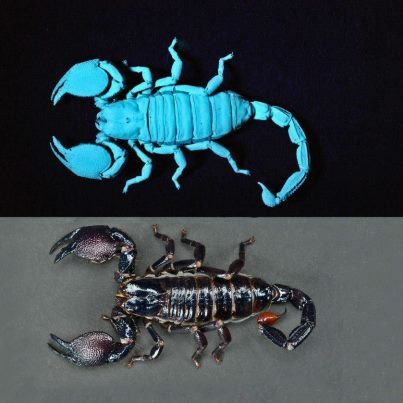 Scorpions have the rather unusual ability of fluorescence, giving them an eerie blue color if they are under an ultraviolet light source powerful enough to override the normal optical wavelengths, which includes the light reflected onto Earth by the Moon. This means that, as long as there's enough moonlight present, scorpions will appear to glow in the dark. Some say glowing might help scorpions find each other; their earth-tone coloring makes them otherwise difficult to spot in the desert. Others think they do it to dazzle prey. Alternatively, the light conversion effect could act as a sunscreen. Upon experimental investigation, however, none of these hypotheses hold up to scrutiny, leading some arachnologists to speculate that scorpion fluorescence has no function at all. Perhaps, they say, it's just a random act of evolution. "They may be using UV as a way to determine whether or not to come to the surface to look for prey, based on the light levels. My thinking at this point for why they would respond to UV is that there is a UV component in moonlight. [Fluorescence] may be part of the mechanism by which the scorpions respond to moonlight." The idea is based around study of scorpions' habits. They're nocturnal creatures, and it appears that they actively avoid contact with any ultraviolet light, including that of the Moon. Their fluorescence might actually work as a UV detector, telling them when it's best to lie low and take it easy. When the Moon is no longer full, scorpions become more active, which means they can go about their business without glowing in the dark. Which, now that I think about it, is actually quite a bit more frightening than when the scorpions are gracious enough to advertise their presence.